Explorers “run the rapids” in Speakeasy Stage’s “Men on Boats.” Nile Hawver/Nile Scott Shots. 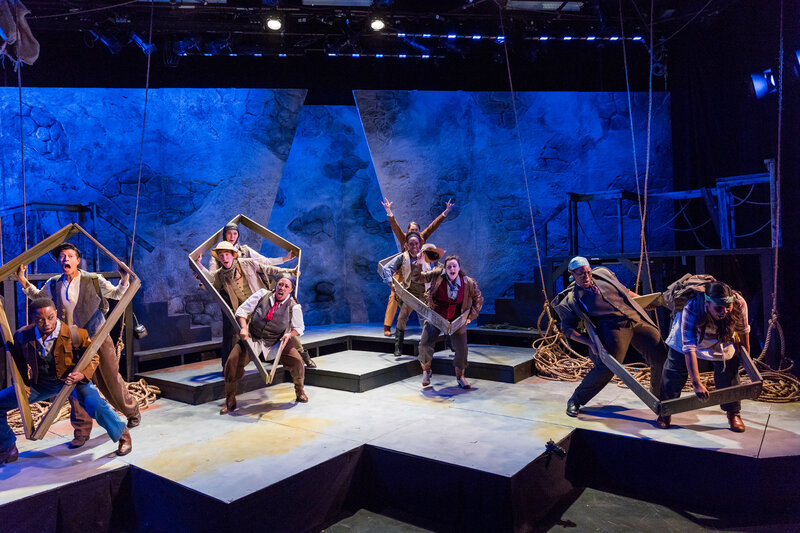 BOSTON – Even before it begins, SpeakEasy Stage Company’s “Men on Boats” has broken away from the testosterone-filled, macho mentality of the classic adventure story told on stage and scene. It is, at first, an off-putting idea to exclude a particular group of people – in this case, cisgender white males — when casting in a Boston theater scene increasingly committed to diversity, especially in the area of non-traditional casting, creating more opportunities for all actors in roles traditionally in the past reserved for white actors. But Backhaus wanted this story to be told by people, like herself, who would never have been part of John Wesley Powell’s expedition or never had the opportunity, in the past, to to portray such characters onstage. Director Dawn M. Simmons and nine of the 10-member cast are making their SpeakEasy debut in this tale, largely based on “The Exploration of the Colorado Rivers and its Canyons,” soldier, adventurer and explorer John Wesley Powell’s journal of the 1869 expedition he organized at the request of the U.S. Government. 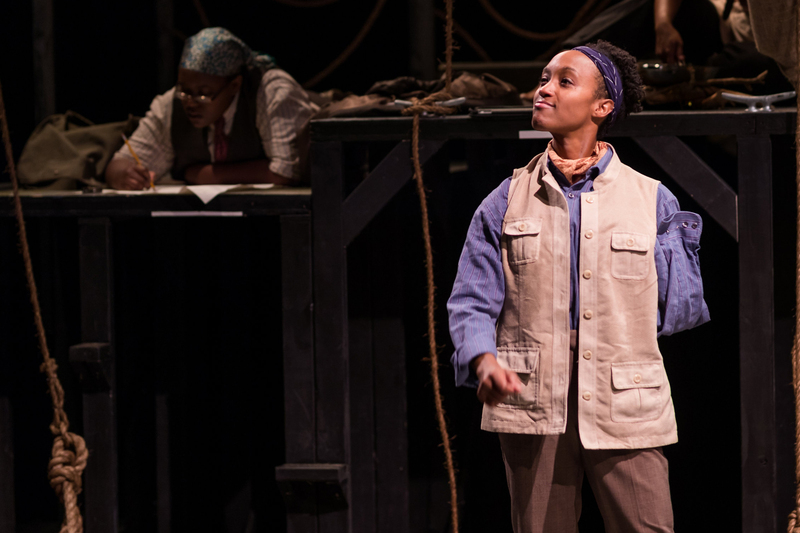 While the production features skilled direction and the unbridled energy and enthusiasm of the cast, “Men on Boats” is a mixed bag. Backhaus struggles to convey the immense challenges facing the expedition and to flesh out the characters beyond the surface. Perhaps she was faced with largely fashioning them out of of whole cloth, due to the scarcity of information on some of them. Robin JaVonne Smith as John Wesley Powell in “Men on Boats.” Nile Hawver/Nile Scott Shots. That show had advantages that Backhaus didn’t have That included many more sources of information about the men and women in the life of the central character. Robin LaVonne Smith, late of Ryan Landry’s Gold Dust Orphans, doesn’t convey the indomitable spirit and leadership qualities you’d expect of an adventurer and soldier such as John Wesley Powell, but it’s possible that’s what Backhaus had in mind – turning the stereotype of a macho leader on its head. Veronika Duerr does a nice job with the character of William Dunn, a hunter and trapper who helped feed the explorers; Ally Dawkins’ Hawkins is the expedition’s harried cook; Mal Malme has some fun moments as Powell’s Civil War veteran brother, the laconic, ditty-singing Old Shady. One of the best moments in the production has the cast in a rousing tribute to John Barleycorn himself, when a jug of whiskey is rescued from a wrecked boat and enjoyed. The cast also includes Bridgette Hayes as guide John Colton Summer, Hayley Spivey as soldier George Bradley and Alice Kabia as skilled oarsman Andy Hall. Of course, Backhaus along the way is having fun at the idea of Powell and Co. actually “discovering” areas where Native Americans and even other assorted settlers were inhabiting for many years before they undertook the expedition. She even has Powell detail the three “rules” for naming something after yourself. And she also notes that while Powell will go on to fame and fortune and have Lake Powell named for him, the other members of the expedition won’t fare quite as well. Physically staging or suggesting a tale as big as the Great Outdoors – does it get any bigger than the raging waters of the Colorado and the Grand Canyon – required some highly creative and very physical theatrical staging to suggest the 10 men in their boats, eventually winnowing down to six explorers in two boats. There are moments of humor, but this is hardly a comedy, and the moments of real drama are sporadic, coming and then going and sometimes disappearing for long stretches. The overall effect is that while Backhaus makes some cogent, valid points about the explorers and their motives, “Men on Boats” struggles to consistently portray the dramatic elements of the expedition. The fault doesn’t in the cast or Director Dawn M. Simmons or the cast; there just isn’t enough meat on the bone to make the piece stronger than it is.